Like all conservatives, I was sure on the edge of my seat about whether I could eat food today. I wanted to, of course, but my mind is small and cannot understand the concept of chewing, swallowing, and peristalsis. Thank goodness food czar Michelle Obama has now given me the okay to eat, or I may have died of starvation in the coming days. 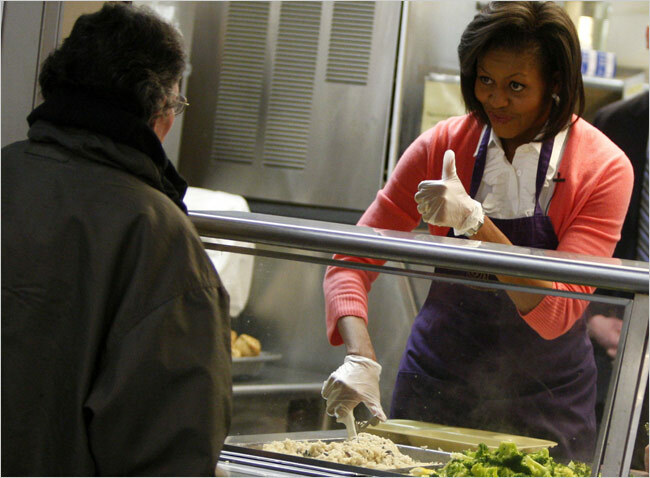 Facetiousness aside, why would Michelle Obama think that anyone would care whether she said that we could eat food today? Apparently her husband's arrogance is rubbing off on her. Michelle Obama said it's fine to eat what you want on Thanksgiving. "Don't worry about how much you eat. Just enjoy it," she said. "This is the time. Have pie." "This is the time. Have pie." Ugh. I'm sure I don't need to say this, but I believe that individuals should be able to decide what (legal) food they can eat without Big Government or Big Brother (or sister) telling me what to do.